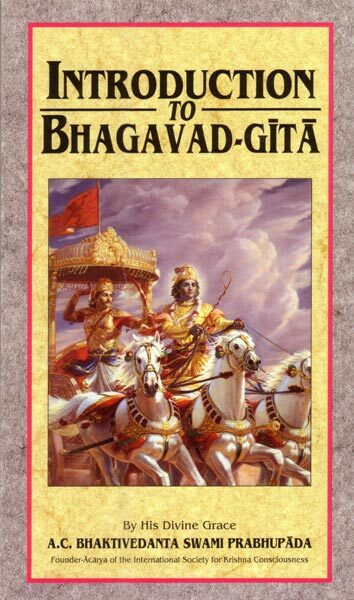 Introduction to Bhagavad-gita is a valuable companion to any edition of the Bhagavad-gita, and every bit as informative as the book it was intended to introduce. Srila Prabhupada wrote it in 1968 as his introduction to Bhagavad-gita As It Is—before he even knew if he'd be able to publish the entire Gita—and included within it the essence of all the Gita's teachings. Introduction to Bhagavad-gita concisely explains all the Gita's major themes, such as the difference between the self and the material body, how to prepare to leave the body at death, and how our eternal dharma (essential nature) differs from what's known as "religion." Also made clear is the distinction between God and the individual self, how understanding the personal feature of the Supreme goes beyond any impersonal conception of God, and much more.